May I trust myself and my abilities as I set and reach for my goals. Often it is easier for us to see the gifts of others and to deny our own abilities. This inaccurate understanding of ourselves can cause us to close doors that very well may be wonderful and joyful opportunities for us. Imagine what your life could be like if those dreams you hold in the bottom of your heart and deny are possible and could be awakened and realized. What dreams have I denied myself through self-doubt? If I am honest with myself, what am I really good at that I often don’t acknowledge or give myself credit for? If I embrace these strengths and abilities, what goals suddenly become a reachable possibility? In this post, my goal is to share one of the big self-care strategies that has worked for me. I don’t claim to have all the answers; I just believe in being open about my mental health struggles in order to hopefully help destigmatize these struggles and to share tools that may help others. I have seen several counselors, and I take anti-depressants. Both of these have been important for managing my mental health. In this post, I’m going to focus on the things I do (or am planning to do) outside of counseling and meds — though those two things are definitely self-care as well! Several years ago, I was at a very, very low point. I could make it to work … usually, if I could rush out the door before I started crying and couldn’t stop. At home I did nothing. I didn’t want to do anything, I couldn’t even think of anything to do. Any things I could think of felt absolutely and completely overwhelming. I wasn’t cooking or cleaning much or at all, and I wasn’t taking very good care of myself. Holding up my end of friendships wasn’t happening, and I felt such a huge, sucking emptiness somewhere between despair and numbness. I thankfully had a good counselor at this time. I don’t even remember how this came about, but we started brainstorming a list of things I could do. An actual written list I could take home and look at when I was not in a space to be able to think of anything by myself. So I took home my list written on yellow legal paper, and that list gave me a sense of purpose that I hadn’t felt in a while. I was trying to think of some way I could reward myself when I did something. 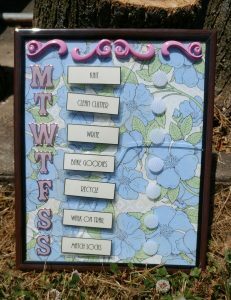 A friend and I had long ago abandoned a project involving using a frame and clips to make a menu board, but that gave me an idea. My reward was to move the one thing for the day to the second column to show I’d done it. And it really did make me feel good when I was able to do that. And there were plenty of days where I was not able to do that. But this really was one tool that gave me somewhere to start. And that made a huge difference. Later I made a board for exercise, and all the tabs were different ways I could move my body. I had a chore one and a more “fun” one too. I’ve been frustrated with myself over the last couple of years for failing to stick to my plan of regularly posting on my blog and of posting daily on my Instagram. But I’m done being frustrated with myself. I’ve been a busy, busy bee. Not just in my daily life of juggling depression and cptsd with teaching and grading and trying to still at the end of the day be a halfway decent person for my husband to be around. Not just those things. I’ve been deep down in my Moon-y subconscious processing and transforming trauma. 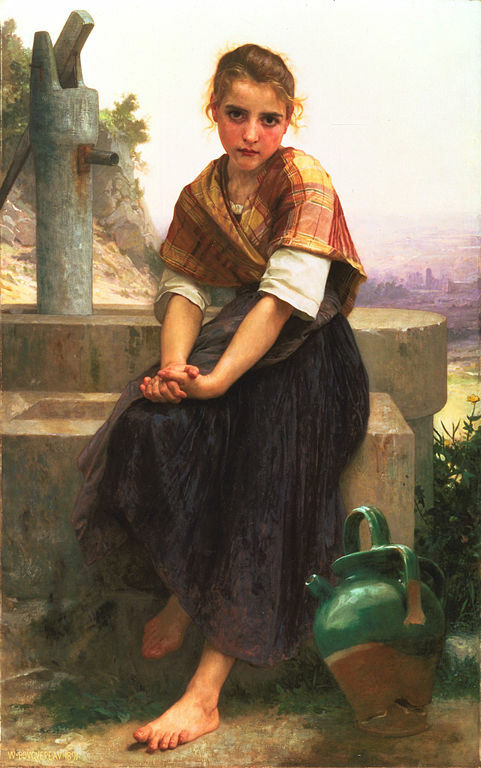 It’s been draining my energetic well faster than I can refill it! Even if the vast majority of days I couldn’t see it and didn’t feel like I was making progress. Even when I felt disheartened. I did attempt to be gentle with myself — to sit with the unpleasant and uncomfortable feelings and to not rush healing. To cut myself some slack when I wasn’t able to reach my goals. I can’t say I was successful all the time — or even most of the time — but it did get easier the more I really practiced it. However, recently I have felt a release. Something has changed. If I was a seed, I’ve finally pushed through the dirt and I can see the sun. I’m a sprout! I still have growing to do and lots of hard work, but where I am now is nowhere near the place I have spent the last few years. That doesn’t mean I’m not still juggling depression and cptsd with the rest of my life, and it doesn’t mean that my energetic well is magically full or “normal.” It just means I am feeling better than I was, that I have become so much better at honoring my own needs, and that the energy that was being used up while I was a seed is now available to use for growth in my next season of life. I am going to set a goal to revive my website because it gives me joy. I will just be more realistic about how often I am able to post. Posting “regularly” doesn’t have to doesn’t have to mean every few days or every week. If I can get one post a month up, I will be very pleased with myself. It has been transformative to take charge and start guarding my energetic well. I often categorized so many things as “oughts” and “have to’s” that I felt I had no choice but to be run down and, inevitably, have regular emotional crises when I would have no energy at all left to deal with even “small” things. I had no idea that many of the things I took on I didn’t actually have to do. And (healthy relationship) people wouldn’t hate me for not doing this or saying no to that. I sure would have liked to know these things earlier, but I don’t know if that would have been possible. I needed a lot of experience and practice. And let’s be honest, I don’t even think I’m great at monitoring my energetic well now — I’m just way better than I used to be. So I still have lessons and practice ahead of me. Like when one of my first counselors said I should just tell a toxic person I wouldn’t speak with them if they talked to me a certain way. “Uh, what are you even saying to me?? Let’s get back to reality, lady.” There was absolutely no way I could go from being totally submissive and fearful and feeling obligation to being assertive enough to say, “Don’t speak to me like that.” I needed lots of tinier practices leading up to standing up for myself. So this is not a post where I tell you that I have it all figured out and you should too. Just a post where I reflect on the journey and feel really good about where I have found myself. I know I’ve got trials ahead, that I’ll make mistakes, that I’ll be angry with myself. And yet, I am still proud when I turn around and see what I’ve left behind. I’ve been away from my blog for quite a while now, mostly due to attempting to get a handle on my depression and some recent trauma. I’ve done a lot of thinking about trauma, emotions, conflict, positivity, and negativity. Here I try to organize these thoughts. I know there is a lot of popular talk about the power of perspective and choice in how we feel. The ole, “You can’t control what happens to you, but you can control how you react.” I get it, and I agree with it to a point for “smaller” life happenings. 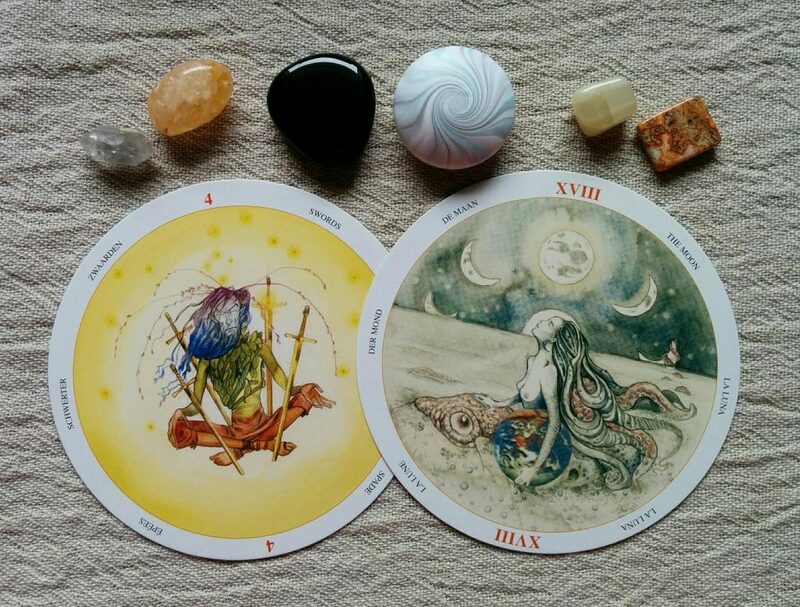 However, like most advice I’ve gleaned from Tarot since I began practicing, I believe this adage is best understood as having positive and negative aspects, a time and a place. Choosing to not complain when my husband doesn’t replace the trash bag. Brushing off repeated spam calls or a rude cashier. The neighbor’s dog escaping their yard (again), coming onto my porch, and sticking its face in my glass of iced tea. “Turn the other cheek,” says to me, “Your feelings are worth less than your abuser’s. Keep taking the abuse.” I am fond of explaining that a person only has so many cheeks. “Everything happens for a reason,” says to me, “Your pain and suffering is inevitable, unavoidable, and what god / goddess / the universe / source / etc wants for you.” No, actually, my trauma-level pain and suffering would be quite avoidable if certain people had not abused me. * And I am worth more than being treated like trash! Period. “Look for the silver lining,” is like a hybrid between “the power of positive thinking” and “everything happens for a reason.” Surely there’s some lesson so shiny and pretty that this was all worth it! Nope. There’s not. The loveliness of positivity gets a lot of press. And that’s, well, lovely. But I think it is incredibly important for people who are survivors of trauma and abuse to also hear that positivity is not always the right answer. Because when this advice is given to survivors, it can feel an awful lot like, “Shh, nobody wants to hear that,” or, “It couldn’t have really been as bad as you say.” And that further alienates and isolates us, making it more difficult to heal and feel like valuable, worthwhile people. 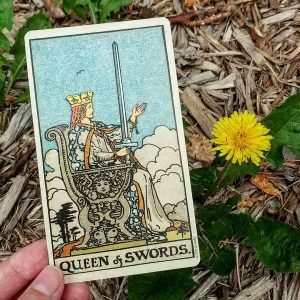 I am the Queen of Swords. I have been to hell and back, and I don’t want any pithy advice that (surely unintentionally) invalidates my emotions, experiences, and understanding of self. *I am definitely aware that abusers can be people who have been abused themselves. At the same time, I do believe that once we reach adulthood, we must do everything in our power to do the difficult shadow-work and not pass on that legacy. Are there structural / cultural issues that need to be addressed that would empower, assist, and encourage people to better heal and recognize their behaviors? Without a doubt! Sometimes “everything in our power” isn’t enough as individuals to heal / change / grow. Community and access to resources are so important. Perhaps that’s a post for another time. May I remember that caring for loved ones often takes a village. This meditation hits home for me this week. My sister had her first baby on Wednesday, and today Mr. Donkey and I found out that a different family member is in the hospital in serious condition. Through joy and through sorrow, it takes a village. This week, may I carefully weigh what parts of myself to share with others and what parts to keep hidden away. 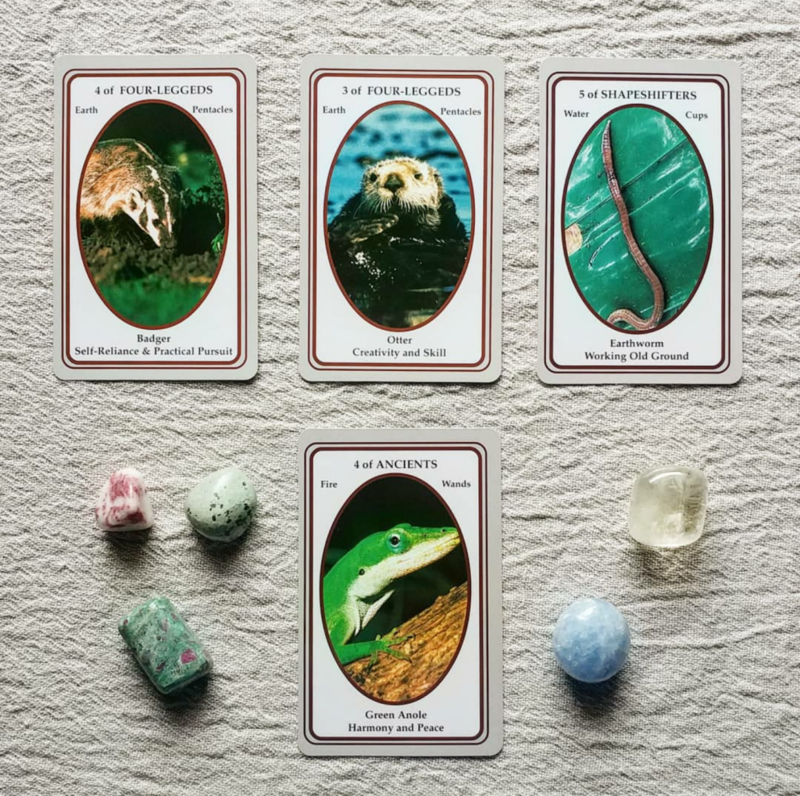 In Kim Krans’ guidebook for this deck, each of these cards speaks to what is hidden and what needs to be brought into the light. Sometimes we hide parts of ourselves or our feelings from fear of rejection or retaliation. Sometimes we hide parts of ourselves in self-protection. And these are not always bad things. Take this week to decide what parts of yourself should remain secret (or sacred) and what parts of yourself might be good to share with others. You can share with the whole world, or you can share with a select person(s). And if they are worthy of your time and love, they will be grateful for the insight into who you are — whether that is a magical aspect of yourself or a part of yourself you struggle with. No matter the trials I may face this week, may I remember to remain connected to those I love and who love and support me in return. This last week has been very intense, to say the least, for many people. As these emotions bleed into this week or as new trials arise, remember that you are not alone. Turn to your (chosen) family and your friends. Ask for a shoulder to cry on or a night at the movies. Share your joys and fears, and ask for help if you need it. Or if you are able to, provide help to someone else who may be struggling. Have I been stuck in a rut lately? Might a new interest or hobby add a new spark to my life? This week, may I allow myself to explore something new and see what excites me. 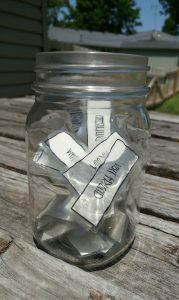 And here the wands make a return to our Weekly Meditations! 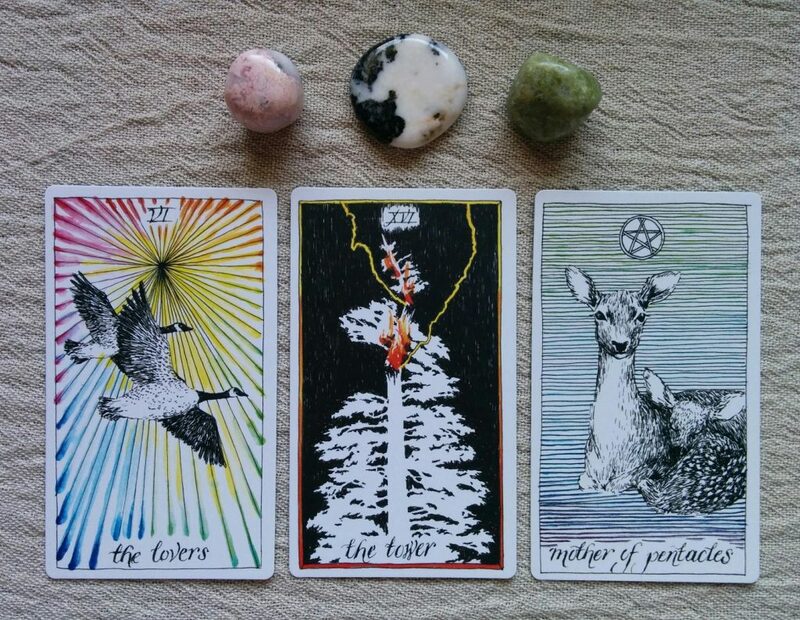 But this week’s message from tarot asks us to think about whether we have something in our life that excites us. Would a new interest help to add a little spark, a little pep to our life? Is there a topic you’d like to learn more about? A spiritual practice you’d like to adopt? A hobby you’d like to give a try? A place you’d like to visit? Shhh. This week may I remember to slow down and listen to my body, mind, and spirit. What kind of rest or refill do I need? The last three weeks’ meditations have been so wand-heavy. 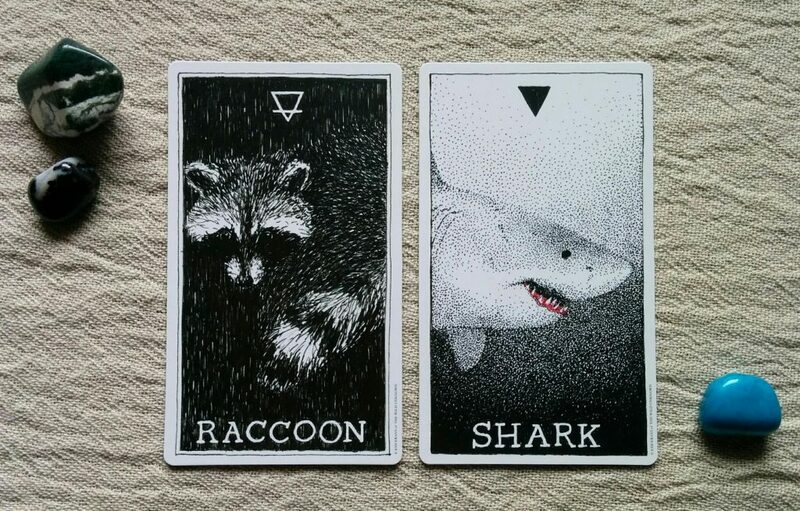 This week’s cards urge you to stop and listen to your inner voice: what does you body, mind, and/or spirit tell you you need? Do you need rest? 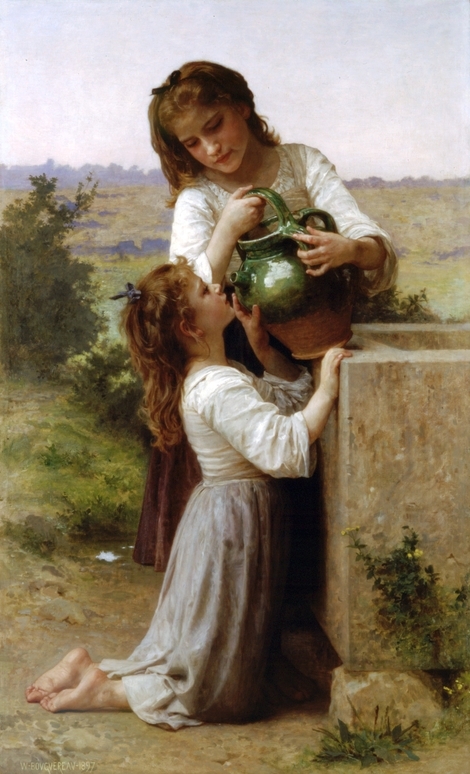 Do you need to engage in something (or with someone) in order to refuel or refill yourself? Take a nap, go for a walk, meditate, read a book, or cuddle a loved one (human or animal!). Your health — physical, mental, and spiritual — is incredibly important. Treat yourself and listen to yourself like someone valuable. I am one person with a finite amount of time and energy available to me. May I take my tasks one at a time, one moment at a time. I may have much to do, but this steady approach will see me through. Wow! 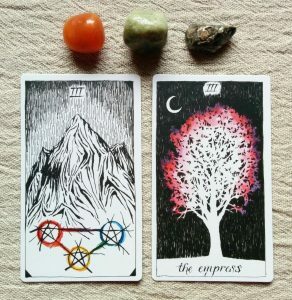 Another Eight of Wands this week, only rather than being paired with the Ace of Wands like last week, it is paired with the Knight of Wands. 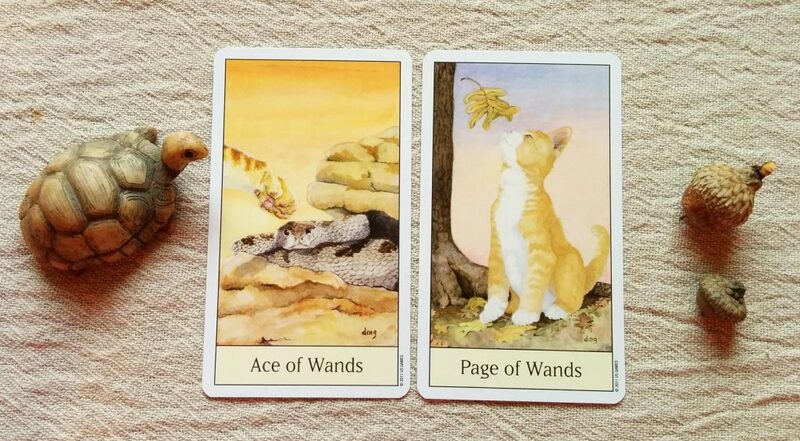 I can’t lie — I am not feeling very Eight of Wands-y. Or knight-like. I am exhausted! I would welcome a stretch of days with a rest from my responsibilities. However, reality has something else planned for me; there are things to be done and deadlines looming. 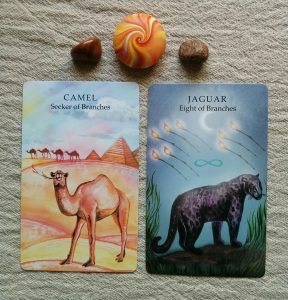 I think that the main message for this week is the message that the camel gives in the companion book for the Animal Wisdom Tarot: “Small steps lead to great distance” (51). It’s cliché, but sometimes we would do well to remember that we can only tackle one thing at a time, one day (or moment!) at a time. Two weeks ago, we were reminded to let go of things we don’t actually have to do. This week we’re given advice for when that long list simply must be done. One thing at a time, my lovely friends! One thing at a time.